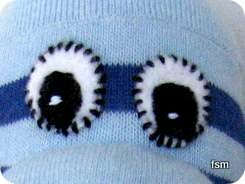 when making any sock animal toy. Step one: You will need blue striped socks. 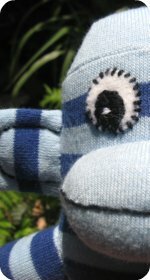 Follow the basic sock monkey pattern and instructions to make the body, arms, legs and mouth of your sock monkey toy. Eyes: First cut two oval shapes from white felt. 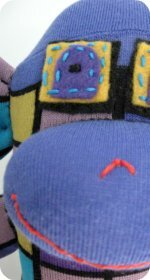 Embroider black thread in the center of the felt to create the pupil. Then add a few stitches of white on top of the black thread. 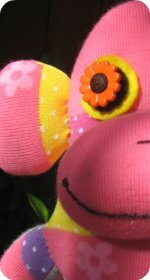 The white felt is then attached to the sock toys head using large black stitches. 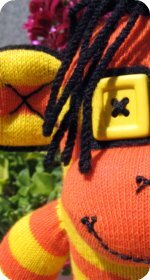 Ears: The ears were purposely cut so the stripes on each ear went in different directions. They were sewn together and embroidered with black thread. 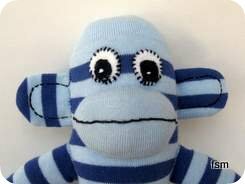 TIP: If you are wanting to make small sock toy monkeys or other sock animals for small children you can use small socks. The smaller the socks the smaller the toy. 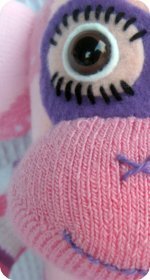 Using small socks create extra skinny arms and legs, which are great for little hands to hang onto. 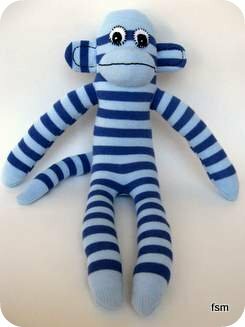 I used the modern sock monkey pattern to make this particular monkey but if the vintage sock monkey pattern was used the monkey would have a longer tail and have even skinner arms.